WASHINGTON: The White House on Monday said that responsibility for deadly political violence that has destabilized Nicaragua lies with President Daniel Ortega and his wife. In a statement, the US government said it “strongly condemns the ongoing violence in Nicaragua and human rights abuses committed by the Ortega regime” in response to political protests. More than 300 people have been killed and 2,000 wounded in more than three months of unrest against Daniel Ortega’s administration. Pro-government paramilitaries have targeted those demanding Ortega and his powerful vice president, wife Rosario Murillo Zambrana, resign. Doctors have been attacked for treating the wounded. “President Ortega and Vice President Murillo are ultimately responsible for the pro-government parapolice that have brutalized their own people,” the White House said. The US has hit top officials with sanctions, tightened visa restrictions and backed church-led efforts to secure peace. Ortega, aged 72, is a long-time bete noir of the US government. He headed a left-wing Sandanista government during the Cold War, and returned to power in 2007. 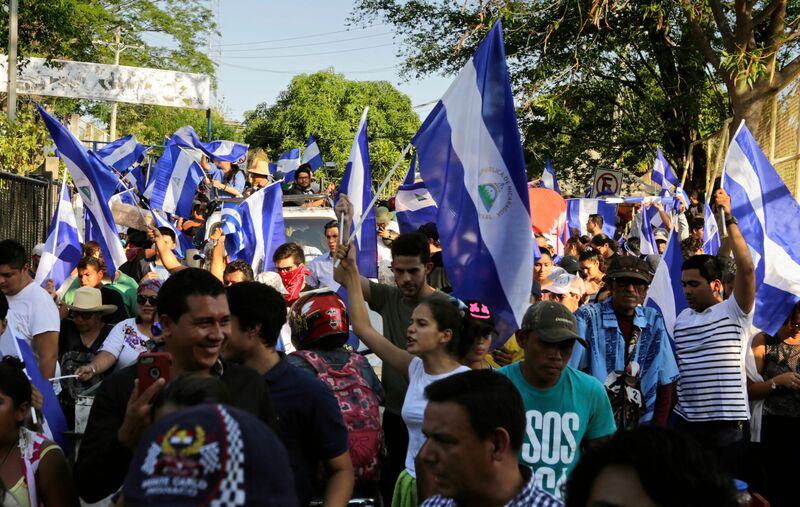 “The United States stands with the people of Nicaragua, including members of the Sandinista party, who are calling for democratic reforms and an end to the violence,” said the White House.